Reel Talk Online: Wait...There's Going To Be a New Power Rangers Movie? Wait...There's Going To Be a New Power Rangers Movie? This is the first question I asked myself when I received an email announcing two new writers that have joined the upcoming movie. But wait, this was just hours after I heard about a Rainbow Brite reboot! A RAINBOW BRITE REBOOT! And now...a new POWER RANGERS MOVIE! I guess I can't be surprised, what with Scooby Doo, Teenage Mutant Ninja Turtles and Jem and the Holograms in the works. All we need now is a new My Little Pony movie and we can all just pretend it's 1989 again and go roller skating or something. According to the press release, X-Men: First Class and Thor screenwriters Ashley Miller and Zack Stentz have just signed on to pen the new Power Rangers film for Lionsgate. Star Trek producer Roberto Orci has also been added as executive producer. Orci will develop the movie’s story along with Miller and Stentz, with the latter two handling screenwriting duties. 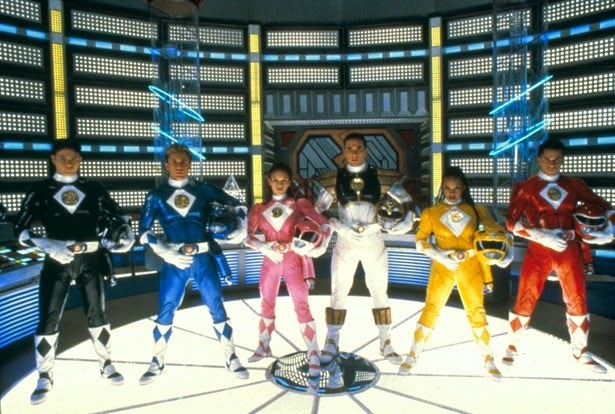 Those of you who watched the original 90s TV series may remember that the show, formerly titled The Mighty Morphin Power Rangers, centered on teams of young heroes and took much of its footage from the Japanese live-action show, Super Sentai. On the bright side, for those of you who are skeptical of the reboot, the original franchise creator Haim Saban is one of the producers of the film, along with Allison Sheamur (The Hunger Games), so hopefully that means the essence of the original series will be retained. We'll have to wait and see once everything comes together. Of course, the biggest question will be: who will play the new version of the characters? Any thoughts on who you'd like cast in the film? The first thing that came to my mind was "is the reboot going to be as subtly racist as the original?" Power Rangers, just never understood the interest to be honest but apparently there's a huge fan base.